Roberto wrote: whose witness statements am I supposed to be ignoring? Not that of Mr. Leleko. Actually you are ignoring his statement, as he claimed that there was only one cremation facility, which wouldn't have sufficed to burn all the bodies. Roberto wrote: Interesting, except that all the weight was bearing on the collapsing structure's middle point in the fire, wasn't it? So what? The moment imposed by a point load at the center of a span is twice that of a uniform load, so if the load were concentrated at one point (it wasn't) it would have been equivalent to 2*3000 = 6000 pounds in uniform load as far as yield strength is concerned. Notice that the failure occurred at such a low temperature that the beam was not even glowing. It isn't even glowing, but it still bent under its own weight! The rails in the video were bent in a direction that would be horizontal when the rails were in the ordinary orientation for rails. But a wisely set up cremation facility would rest the rails on their base, so that in an ideal world we would only have to worry about vertical bending. Rails are stronger when their profile looks kind of like an I-beam than when their profile looks kind of like an H-beam. On the other hand, Samuel Rajzman spoke of carrying rails which “had to be carried by a team of six or eight people.” He also emphasized how weak the carriers were. If the rails weighed 60 kg per meter, then 30 meter long rails would have weighed 1,800 kg, which certainly could not be carried by a team of six or eight people. Such a team of prisoners would probably not be able to carry rails any longer than 5 meters. How about rails 20 meters long, or rails only 10 meters long and aligned in such a way that their added length was 20 or 30 meters? How about substantiating the "would probably not be able to carry rails any longer than 5 meters" claim? And how about considering the possibility that heavy rails were carried 5 meters at a time? It's not that the rails never bended or broke, you see. There's testimony suggesting that they had to be replaced at certain intervals, see testimonies quoted here. Question is, how long did each rail last? We know from a source kindly provided by FJ that they burned the bodies to ashes there, and the picture below also suggests that they achieved a more thorough degree of cremation than is suggested by these images and related site investigation reports regarding Treblinka. We know from the source parts of Mr. Taylor's writings, quoted here, that "the dead were burned at the rate of one pyre per day, with around five hundred corpses per pyre" (and the average weight of these corpses was certainly higher than at Treblinka, as there were no decomposed corpses and/or corpses of malnourished people among them), that the cremation "was carried out under the supervision of outside SS experts", and that "these were said to be former staff from the notorious extermination camp at Treblinka". Pictures are something we don't have for Treblinka, without that keeping FJ from producing elaborate conjectures about how the rails would have behaved when corpses were burned there. So, would the Dresden cremation device also have been rendered useless by the weight above and the heat below the fire before the job of cremating 6,865 corpses of air raid victims was accomplished? Let's see the calculations whereby FJ demonstrates that and why this would not have happened. After all the Dresden cremation pyres are the closest match to the Treblinka cremation pyres outside the context of the Nazi genocide of Europe's Jews. Yes, in Roberto-land a witness who talks about the cremation facility (singular) is really talking about several cremation facilities. In the first video above, the rails were severely bent after around an hour in the fire. That degree of bending, if it occurred at one of the Reinhardt camps, would destroy the cremation facility. And these rails were not even loaded! Therefore rails could not have withstood the heat of the cremations. There’s a natural objection to this argument. The rails in the video were bent in a direction that would be horizontal when the rails were in the ordinary orientation for rails. But a wisely set up cremation facility would rest the rails on their base, so that in an ideal world we would only have to worry about vertical bending. Rails are stronger when their profile looks kind of like an I-beam than when their profile looks kind of like an H-beam. How much more resistant are rails to vertical bending than to horizontal bending? We’ll see in section 4 that they are about six times more resistant. In the video, rails bent under their own weight. But the holocaust story claims that thousands of bodies were stacked on the rails during the cremations – a load much more than six times the load of the rails’ own weight. Therefore the rails would not have had the strength to support the Reinhardt cremations, so the Reinhardt story cannot be true. The figure 6 is actually on the high end, and refers to the ratio of the moments of inertia in the two axes; this corresponds to the ratios of the (elastic) deflections. With respect to yield strength, which will be the limiting factor (unless it's shear, and ignoring buckling) for the shorter spans Roberto has been forced to postulate, the ratio will be somewhat lower. 3. If Roberto wants calculations done for his fantasy weights, he can do them himself. Imitating my calculations is easy - all the information is there. All he needs to do is multiply the bending stresses I calculated by an appropriate factor (the ratio of the weights). Of course if he wants to play with Leleko's testimony he'll have to do more than that, since he'll have to adjust the length of the facility as well, and calculate on the basis of four rails. 4. Rail weight in connection with carrying rails. Roberto wrote: How about substantiating the "would probably not be able to carry rails any longer than 5 meters" claim? How much weight do you think 6-8 Jews who were supposedly severely weakened by life in the camp can carry? Remember, according to you Jews weigh an average of 43 kg... and the rails we are considering weigh 60 kg per meter. Chil Rajchman wrote: He lays down ordinary long, thick iron rails to a length of 30 metres. [...] Six rails are laid down, no more. Roberto wrote: It's not that the rails never bended or broke, you see. There's testimony suggesting that they had to be replaced at certain intervals, see testimonies quoted here. Wrong. There's a late testimony by Blatt with respect to Sobibor, but nothing for Treblinka. The statement about replacing trolley rails does not include anything about replacing the railroad rails. 6. On Dresden, Roberto is just speculating, and such speculation is worthless. Roberto wrote: We know from a source kindly provided by FJ that they burned the bodies to ashes there, and the picture below also suggests that they achieved a more thorough degree of cremation than is suggested by these images and related site investigation reports regarding Treblinka. As we have no picture of the complete remains of a pyre at Dresden, we can make no statement about the completeness of the cremation there. 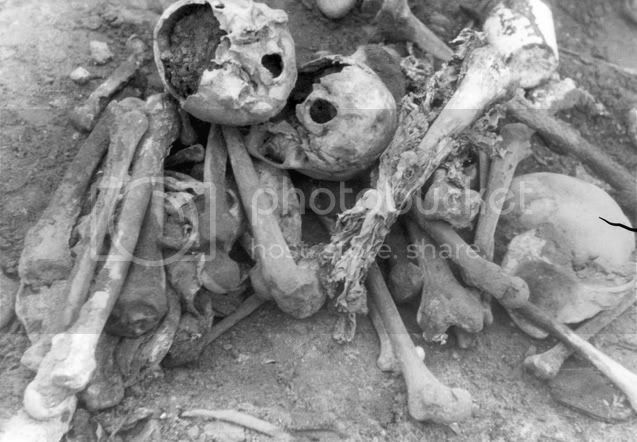 As for the pictures from Treblinka, those bones have never been in a fire. One of them even has tendon rags still on it! This is not what burned bones look like. Burned bones fracture. No, he may have been describing one of the facilities, perhaps at a time when there was only such facility. Considering that other witnesses mentioned several such facilities, that's the correct understanding. The shorter spans I have "postulated" because they are suggested by at least one eyewitness testimony and because, if FJ's calculations (which I haven't checked yet) are correct, the logical conclusion to be derived from this considering the conclusive evidence to mass murder and mass cremation is that information about the number or length of spans is not necessarily the most accurate. Nothing less, and nothing more. friedrichjansson wrote: 3. If Roberto wants calculations done for his fantasy weights, he can do them himself. The "fantasy weights" have been duly substantiated. If anything can be called a fantasy, it's the postulation that the bodies of people including a large proportion of women and children, mostly underweight before being killed, and the better part of whom had been losing water and weight in the mass graves for months before being cremated, weighed a ridiculously high 45 kg on average. friedrichjansson wrote: Imitating my calculations is easy - all the information is there. All he needs to do is multiply the bending stresses I calculated by an appropriate factor (the ratio of the weights). Of course if he wants to play with Leleko's testimony he'll have to do more than that, since he'll have to adjust the length of the facility as well, and calculate on the basis of four rails. On wonders why FJ doesn't do these calculations, then. Could it be because his claims are strongly dependent on the fantasy weights he postulated? friedrichjansson wrote: 4. Rail weight in connection with carrying rails. Arguing on the basis of average weights here is nonsense, of course. The average weight is one for malnourished ghetto inhabitants of all adult ages, including women. Laborers were chosen because they possessed specific skills or because they were physically stronger than the average. For hard physical labor the choice would have been based on the latter criterion. Apparently I misunderstood the claim "Such a team of prisoners would probably not be able to carry rails any longer than 5 meters" as referring to the distance over which the rails had to be carried and not to the length of the rails that could be carried by the work force described, whereas FJ meant the latter. If FJ's assumptions are right, this might mean that the witness understated the number of carriers for whatever reason (perhaps to emphasize his own suffering), nothing more. Note that laying iron rails to a length of 30 meters does not necessarily imply that the rails were 30 meters long. The rails may have been shorter but aligned in such a way that the total length of aligned rails was 30 meters. There's no indication that Blatt was referring to trolley rails (the only mention of the latter, IIRC, is by Stangl in connection with Treblinka), and if railroad rails bent or broke at Sobibór they are likely to have also bent or broken at Treblinka, requiring replacement at certain intervals. How long these intervals were we don't know, but the parallel of the Dresden pyres suggests that each set of rails lasted for at least a period equivalent to the period between 21 February and 5 March 1945.
friedrichjansson wrote: 6. On Dresden, Roberto is just speculating, and such speculation is worthless. Dodging deluxe by FJ, who refuses to try explaining why the rails on the Treblinka pyres are supposed to have bent or broken too often for successful cremation even though the rails on the Dresden cremation facility (which, after all, is the closest match to the Treblinka cremation pyres outside the context of the Nazi genocide of Europe's Jews) did not, at least during the period required to burn 6,865 corpses at a rate of about 500 per day on the Altmarkt. And that although he has sufficient information about the Dresden cremation facility, including the pictures below. Last edited by Roberto on Sat Jun 29, 2013 10:39 pm, edited 1 time in total. friedrichjansson wrote: One other thing. As we have no picture of the complete remains of a pyre at Dresden, we can make no statement about the completeness of the cremation there. suggest as rather thorough degree of cremation. Neutzner seems to be quoting from an instruction by the city administration to the workers in charge of taking the ashes to the cemetery and burying them there. I shall try to find out more about this instruction. friedrichjansson wrote: As for the pictures from Treblinka, those bones have never been in a fire. Considerable evidence also exists to suggest that not all of the bodies were exhumed and cremated. Photographs show bodies littering the landscape as late as the early 1960s. Robbery digging in the wake of the Soviet army's conquest of the Treblinka area, as mentioned in this article, used explosives to blow holes into the soil and facilitate the search for treasures. Where explosions reached as far as the layers of unburnt corpses mentioned by Strawczynski, these corpses were laid bare and then decomposed in the open air. By the time the Polish investigations were conducted (November 1945), such corpses would have been decomposing for periods up to a year or more. Roberto wrote: the remains visible in the foreground of this picture suggest as rather thorough degree of cremation. Where's the evidence that these are the complete remains of the cremation, i.e. that the more intact remains have not been removed elsewhere? As I said, we simply do not have the documentation to make a technical assessment of the Dresden cremations. 8-10 cubic meters is not enough to represent the remains of 6,865 bodies, even if the bodies were burned in crematory ovens and the remains processed. With unprocessed remains the volume would be greater still, and pyre incineration would be less thorough than a crematory oven. Once you add in the ash content of the straw and other solid fuels, it's clear that something is very wrong with this picture; 8-10 cubic meters cannot represent the total cremation remains of 6,856 people, much less their remains together with the ashes of the solid fuels used to cremate them. Oskar Strawczynski: The graves could never be emptied entirely, because blood mixed with water accumulated at the bottom. Motorized pumps were set up to draw it out. However, they could never manage to drain the bottom few meters, and so the graves were simply covered over. Strawczynski's story refers to blood that could not be removed, not to solids that could not be removed. As for the bodies, if an excavator can dig a pit then it can also remove any bodies that were put in the pit. The story of the accumulated blood is also absurd: as we all know, Treblinka had sandy soil and (as RM has emphasized himself) good drainage. Liquids would have simply sunk into the ground. And of course, Strawczynski's story is contradicted by e.g. Chil Rajchman's picture of the liquidation of the graves. Where's the evidence that these are the complete remains of the cremation, i.e. that the more intact remains have not been removed elsewhere? The evidence that the more intact remains were removed elsewhere is wherever FJ can find it, if it exists. So far we have a photo suggesting that all cremation remains from the Dresden pyres looked like the remains in the picture's foreground, plus the estimate of someone reporting to the city administration about the amount of remains (looking like the remains in the picture's foreground, by the witness's description) covering the Altmarkt after the end of cremations, plus an instruction from the city administration on how to proceed with the recipients used to dump what they called "ashes" into the mass graves. All three sources point towards the degree of reduction visible in the picture's foreground. friedrichjansson wrote: As I said, we simply do not have the documentation to make a technical assessment of the Dresden cremations. Well, we do have enough for FJ to try explaining why the Dresden rails obviously didn't bend on the first occasion while the Treblinka rails are supposed to have. Or did I misunderstand FJ's claim re the Treblinka rails? So the witness wasn't very good at estimating the amount of ash covering the cobbles surface of the medieval square? How frightfully shocking! Strawczynski's story refers to blood that could not be removed, not to solids that could not be removed. Who would have mentioned that the graves could never be emptied entirely if all bodies had been removed from them? No one, so the witness is also referring to solids here. friedrichjansson wrote: As for the bodies, if an excavator can dig a pit then it can also remove any bodies that were put in the pit. Maybe so, but for some reason whole bodies at the bottom of the graves were also found at Belzec and Sobibór. Maybe FJ's clients simply considered it too much work to dig up the bodies below a certain depth at these camps. If so, why should they have been less lazy at Treblinka? friedrichjansson wrote: The story of the accumulated blood is also absurd: as we all know, Treblinka had sandy soil and (as RM has emphasized himself) good drainage. Liquids would have simply sunk into the ground. Unless the soil wasn't all that sandy at a certain depth or liquids were retained by corpses in wax-fat transformation. friedrichjansson wrote: And of course, Strawczynski's story is contradicted by e.g. 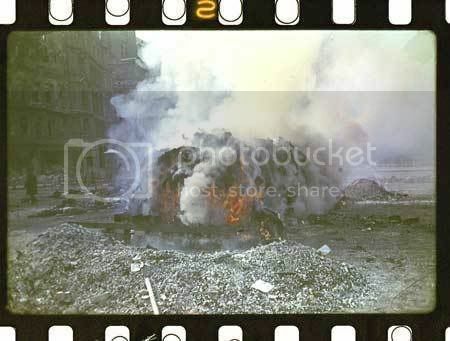 Chil Rajchman's picture of the liquidation of the graves. Which wouldn't be surprising insofar as Strawczynski wasn't a direct witness to procedures in the extermination sector but reproduced things he had been told, probably by Ukrainian guards. Contradiction with Rajchman's account could also be due to the latter referring to different periods of the camp's operation. In any case, contradiction clearly shows that both accounts were provided independently of each other, which increases rather than reduces their value as evidence regarding the essential facts of mass murder and disposal of murder victims. But in that respect the witnesses are supposed to have lied or hallucinated from start to finish, according to FJ's bizarre reasoning. Anyway, what's the contradiction supposed to be? What is there in Rajchman's account to rule out the possibility that corpses remained at the bottom of the Treblinka graves? RM wrote: Well, we do have enough for FJ to try explaining why the Dresden rails obviously didn't bend on the first occasion while the Treblinka rails are supposed to have. Or did I misunderstand FJ's claim re the Treblinka rails? Obviously you misunderstand; more precisely you are arguing in bad faith (this applies to the other points as well). The relevant variables have already been explained. Not to mention the fact that there were no "Dresden rails"! RM is quite the comedian. RM wrote: what's the contradiction supposed to be? I'm sure it will remain a mystery to RM, as he's too lazy to read books. I will not reply further unless (by some miracle) RM's future remarks demonstrate good faith, comprehension of the issues, and familiarity with the texts on which he comments. However, some people may be interested in the role of buckling. freidrich, we who operate this username are too lazy in a sense to comment on some things you are posting here. for example, that cremation thread is so elementary and a quick google search reveals a number of testimonies from people saying they could see smoke and smell the place from kilometres away depending on which way the wind was blowing. Last edited by randomforumguy on Fri Jul 05, 2013 6:50 am, edited 1 time in total.